Here are a few images I took on the evening of March 16, 2019, with a 6" TPO Newtonian (rebranded GSO). Seeing had been really bad for a few days (and before that just rain and clouds), but tapered off to average on this night, but still not enough to get really excited about. However, the outcome with the 6 inch scope is definitely satisfactory. 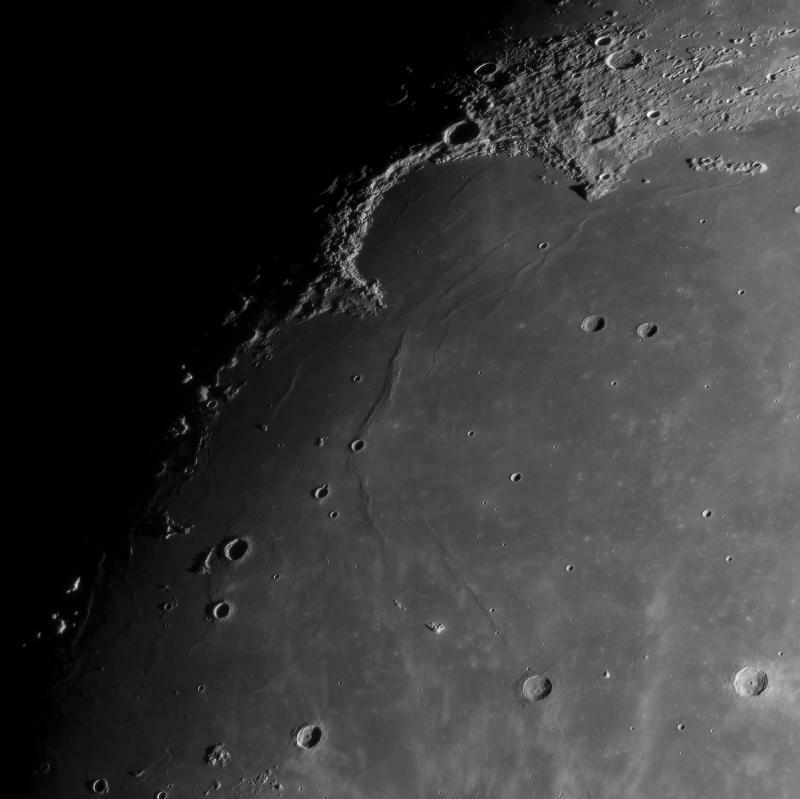 I had never tried imaging with a barlow on this scope before. The scope is f/6 at prime focus with a focal length of 916mm, and I purchased it to fit the entire Moon into one frame with my ASI183mm. With a 2x barlow, the system becomes f/12, and is perfect to maximize the 2.4um pixels of the IMX183 sensor with a green filter. Below I will present a series of images. All images except for the last one (the overview of the entire Moon) were taken using a 2x Televue barlow with the ASI183mm and green filter (Baader, bandpass 500-575nm) on the 6" TPO Newtonian. For these images, I did not use a coma corrector, but instead used a smaller central ROI of about 1800x1800 pixels to avoid coma. 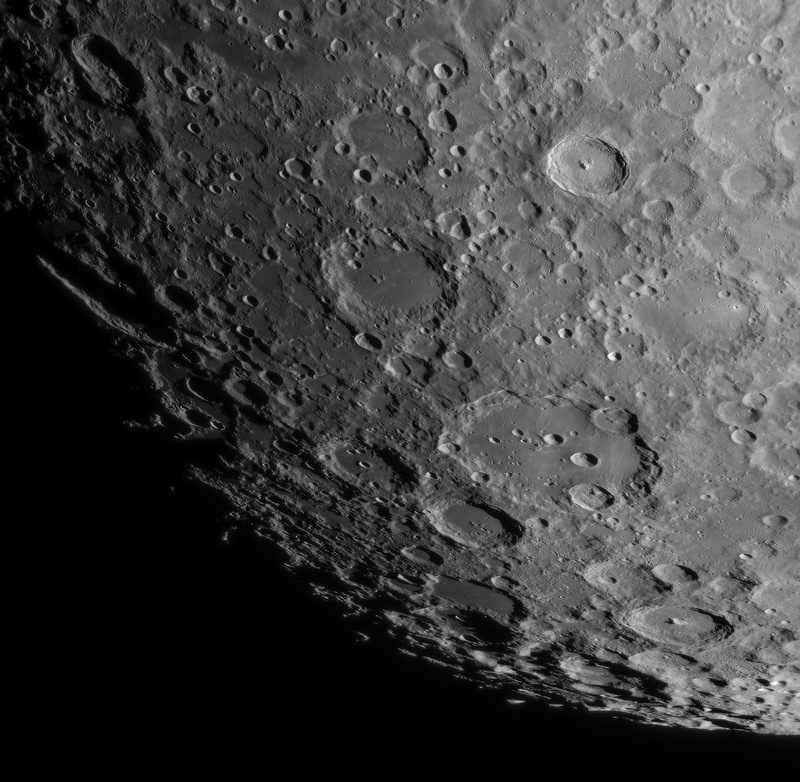 The final image of the entire Moon was taken at f/6 prime focus using the same scope and camera, but with the Baader MPCC Mark III coma corrector and using the entire sensor. The scope only cost $199 new, which is far less than the camera. I like the fact that this demonstrates that you can get a lot from a little, both in terms of money and aperture. When hit by aperture fever, I think many people vastly underestimate the capability of modest equipment. 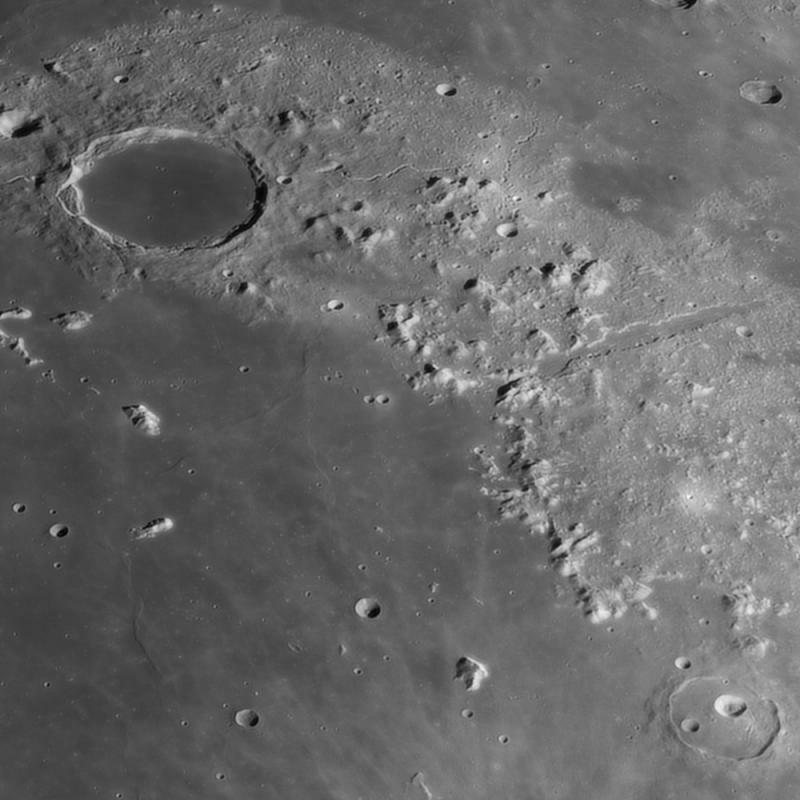 The images below could no doubt be improved in better conditions, but do feature a number of so-called resolution tests that are typically associated with larger scopes.....such as >6 craterlets in Plato, central rille in Vallis Alpes, etc. For each panel, I will first present the downsized image showing the entire ROI, and then a smaller crop shown at 100% scale. EDIT: After posting the first two of these I can see that there really isn't much difference in detail in the cropped version as they are displayed here. My intention was to show the original scale, but I think the downsized version will be better. I'll leave the first two crops as posted, but only post the remaining images as the downsized overview shots. Edited by Tom Glenn, 21 March 2019 - 02:52 AM. Edited by Tom Glenn, 20 March 2019 - 03:50 AM. Those are very nice images from the TPO and very good processing. In fact, I was out on this same night although I suspect that I started later than you did and the moon had already passed the meridian and as usual the Santa Ana conditions got worse later in the night (or morning). 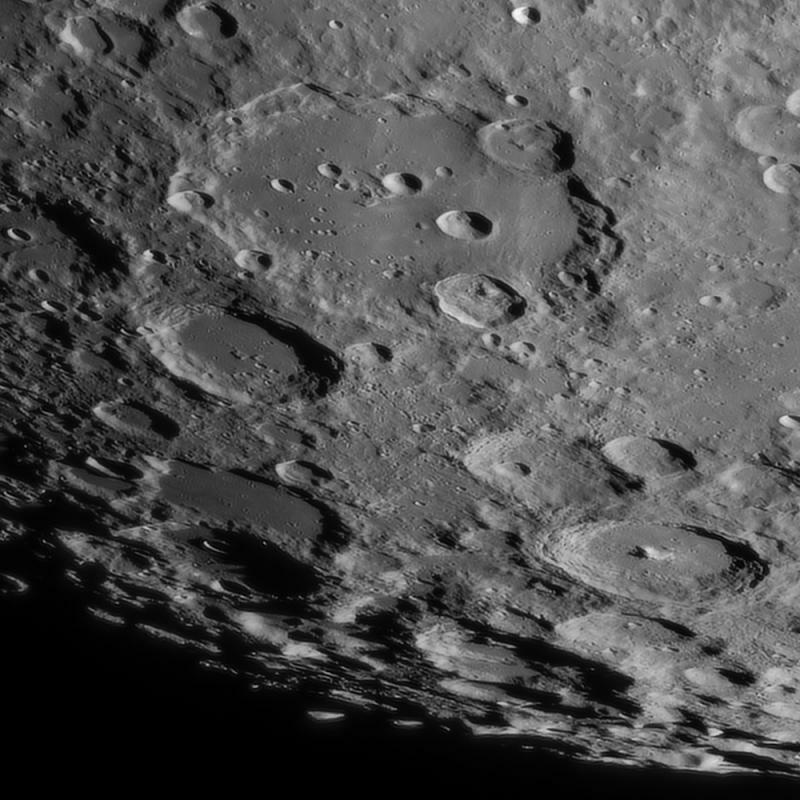 Your Clavius definitely shows more detail that I got with my C6, although I was using an undersampled ASI174MM with a 610nm filter and my image was taken on March 15. Edited by james7ca, 20 March 2019 - 03:52 AM. Thanks James. As always, timing is everything, and the conditions have been so variable lately that I have no doubt that things got worse as the night went along. My images were all taken between about 9:30 and 10:00pm local time. Also, I've found that although the 610nm filter gets many accolades (and well deserved), it does not produce the same resolution as my green bandpass filter. The images are noticeably softer, and in fact, I pretty much use the green filter all the time now, unless conditions look very poor, in which case I probably don't even image at all. A red bandpass filter would probably be very good too.....but the longpass lets too much long wavelength light in and it seems to soften the results. Edited by Tom Glenn, 20 March 2019 - 03:58 AM. I had also taken a screen grab of the live view in Firecapture at the end of my overview shot. 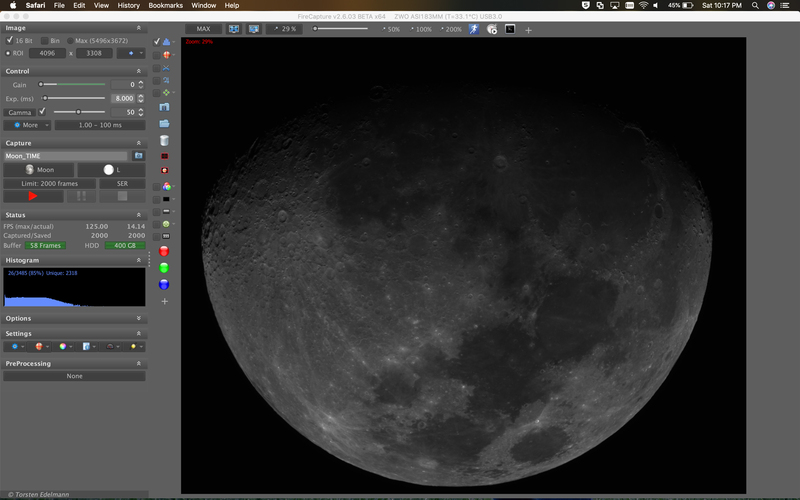 This was taken just for fun, but my resurrected old thread about cameras for lunar work now makes this rather timely. This shows how the Moon fits into one frame with room to spare (in fact I used an ROI here) when using the ASI183mm at a focal length of 916mm. This corresponds to about half the ideal sampling for this camera (the shots above, other than this overview, were taken at f/12), but the resolution of the image at f/6 is actually quite good. When I get around to finishing it the way I like it I may put up a link to Flickr. 610nm = 0.206 x 610nm / 150mm ≈ 0.84"
540nm = 0.206 x 540nm / 150mm ≈ 0.74"
That scales directly by wavelength and the green has about a 12% advantage (or in aperture equivalent to reducing the 150mm to approximately 133mm when using the 610nm filter). And, as you rightly point out, the Baader Long Pass also transmits near IR which has an even lower resolution potential. You may have just provided some results that suggest that it is better to use a green filter rather than a red filter with small aperture scopes. That probably makes sense as smaller apertures are less affected by the seeing conditions (or less limited by same). With a larger aperture you are likely to never get the kinds of seeing conditions that would benefit from using a filter with a shorter wavelength (like green or even blue) and thus using red or even near IR with a large aperture scope makes more sense. I was also out late last night using my 5" refractor with an ASI183MM camera and I took a series of RGB images of the moon and I noticed that each filter seemed to produce a different type of effect in terms of the seeing conditions (or maybe the conditions just changed). Anyway, the red filter seems to produce a less sharp image but the atmospheric turbulence was more global or large scale (like a wave) whereas the green filter seemed to produce a sharper image but with much more small-scale turbulence. I've yet to process all of the frames, but it will be interesting to see if the green image turns out sharper than the red. You've probably seen this before, an image of a close double star (0.9 arc seconds) that I captured using red, green, and blue filters on a 5" refractor (Tele Vue NP127is). The blue image has much higher resolution but this was an example of extreme lucky imaging (for a DSO, probably not at all for planetary or lunar work). Here is the link to the original thread on this double star. Edited by james7ca, 20 March 2019 - 04:42 AM. That looks similar to the framing I got with my ASI183MM when I used the Tele Vue NP127is with a 1.8X AP barlow (giving an equivalent focal length of approximately 1160mm, plate solved). However, I couldn't fit the entire late gibbous moon in one frame, so I did a 2 frame mosaic (the long-dimension width of the ASI183 was okay for the full moon's diameter, but not the smaller sensor height). Very nice images Tom, and I appreciate your response on that old thread I chimed in on👍. Last night I was experimenting with the 9 filters I have but the seeing wasn’t really that good enough (or my eyes weren’t) to discern noticeable differences. That said, the 807 won hands down, just verifying I suppose that the seeing wasn’t great. I’m out again tonight though, looks like it’ll be clear. Edited by kevinbreen, 20 March 2019 - 09:11 AM. Thanks for the additional comments James. I can tell you that images produced with the green filter and C9.25 Edge are also sharper than with the 610nm pass filter. At what point a scope starts to be considered "large" I don't know, but I do on occasion appear to max out the resolution of the C9.25, although only a handful of times a year. To put things in perspective, if I had used the C9.25 Edge to image the Moon here, instead of the 6", the images would likely only have been marginally better than the ones shown above, and nowhere near the limit of the C9.25. This also reinforces my earlier point where I said most people underestimate the performance capability of their scopes. Very often this is due to seeing limitations, but also some of it is greatly affected by technique of both image capture and processing. But as far as seeing is concerned, I've had many nights in the past in which the results from the C9.25 Edge were worse than those presented above from the 6", although when conditions are excellent the larger scope of course pulls way ahead. My issue with the 610nm pass filter is that although 610nm is only slightly beyond green, and so the resolution drop is not much compared to the potential benefit, the fact that it is a pass filter means that it allows so much of the longer wavelengths through that it softens the result. Under many conditions, the benefits still outweigh the costs. 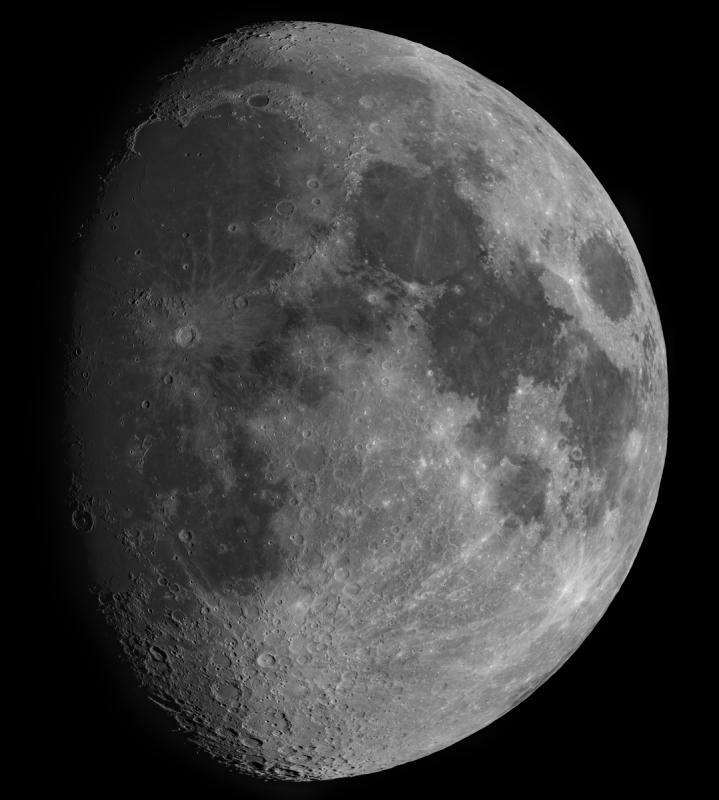 Before I purchased the green filter, I used the 610nm as the default filter for the Moon and have produced many nice images. There is just a slight blur to the images though if you look for the smallest features, and this is what I describe as softness. It's totally acceptable, and often you don't have the luxury of expecting any better, but if you do have the opportunity to encounter good atmospheric conditions, the bandpass filters (either red or green) will likely produce a sharper result. Your example with the double star is very interesting, but as you say, images a single star are very different from an extended object such as the Moon, in which various patterns of turbulence will be present across the entire image field, and you need a lot of frames to stack so you can't afford to be quite as selective as you could be for lucky imaging of stars. Due to the preferential atmospheric scattering of blue light, I think that it's unlikely for a blue filter to produce a better image of the Moon than green or red under most circumstances. Very nice images Tom, and I appreciate your response on that old thread I chimed in on. Thanks for the comments Kevin. I think in your case, since you are fairly experienced at this point in image capture, your limitations are almost certainly seeing related, especially given your location. I have seen your post on the 807, so I'll make any additional comments there. Well taken images with lots of useful information, Thanks for all this! You picked up the rille in Vallis Alpes with a 6" reflector. That's great work by any definition! 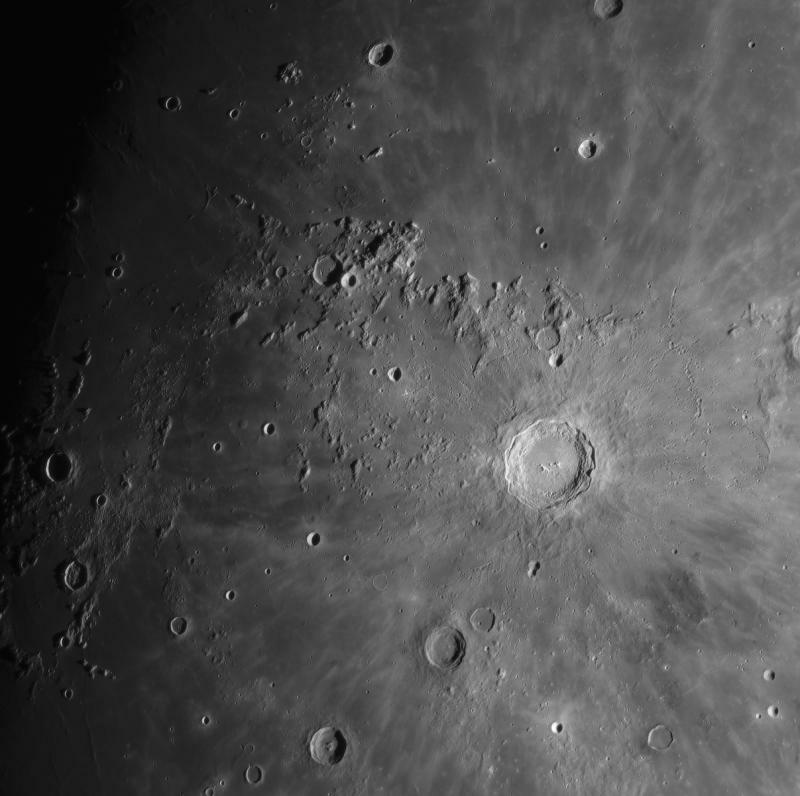 Nice lava domes by copernicus! Always impressive images! This was created by stacking 500 of 2000 frames captured with the ASI183mm operating at prime focus (f/6, 916mm focal length). At f/6, the resolution is half of the capability of this system (in contrast to my other images above which were captured at an ideal f/12), but at f/6 the whole Moon fits into one shot which makes it nice and easy. As you can see from looking at the full resolution image if you click on the download link, the detail is still quite good. A 14 inch print would look razor sharp, and honestly I think this image could be resized and printed even larger and look pretty good. 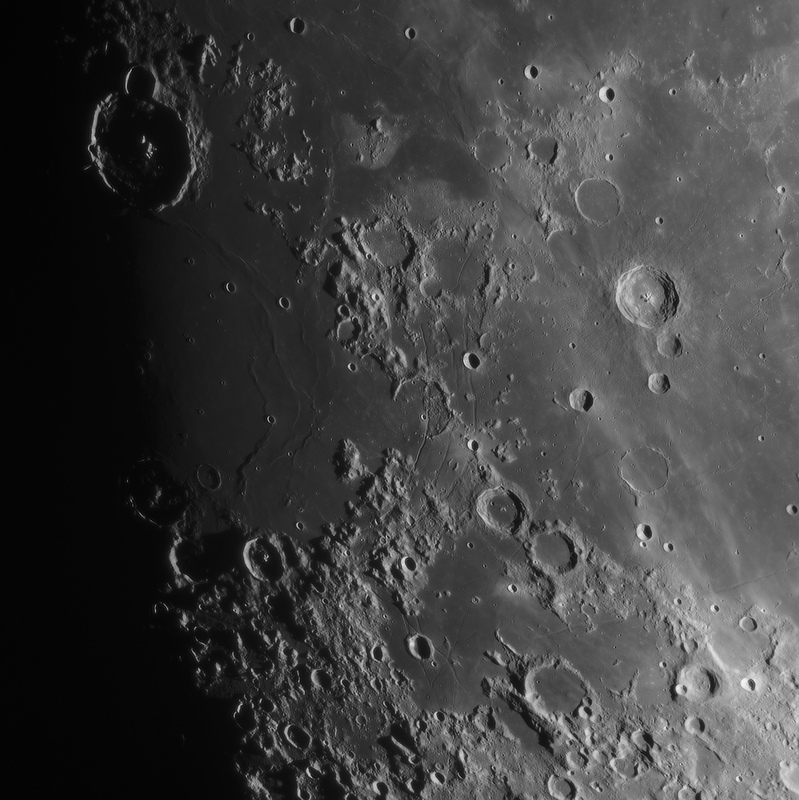 The full-disk image on Flickr is sharp from top to bottom with the Plato and east-side Clavius craterlets. Nicely done. Thanks, James. 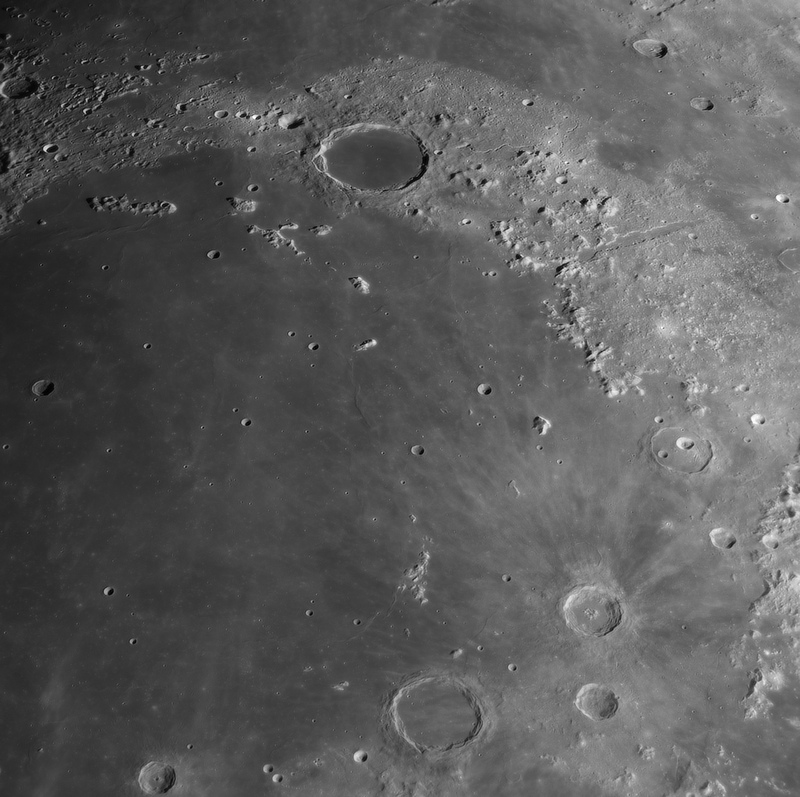 This is the best I've achieved thus far from a single framed (non-mosaic) capture of the full disk of the Moon. And unless an even larger sensor with the same (or even smaller) pixels were to become available, I think it would be difficult to achieve anymore resolution from a single framed capture of the entire Moon, as this focal length (916mm) is already about the max that can accommodate the waxing gibbous Moon without resorting to mosaics. Slightly longer focal lengths can accommodate a first or last quarter Moon, maybe up to about 1200mm with the IMX183 sensor. Edited by Tom Glenn, 21 March 2019 - 03:58 PM. Makes me want to put my Nexstar 5SE on a motorized GEM and see what can be done. Amazing work! Thanks, Matt. There is something enjoyable about seeing what can be done with a relatively small scope. Edited by Tom Glenn, 22 March 2019 - 11:45 PM.